Thank you to World EVP Brian Lim for kickstarting the ACF training. Now it’s time to utilize the JCI Active Citizen Framework as an effective tool and roadmap to change the world. 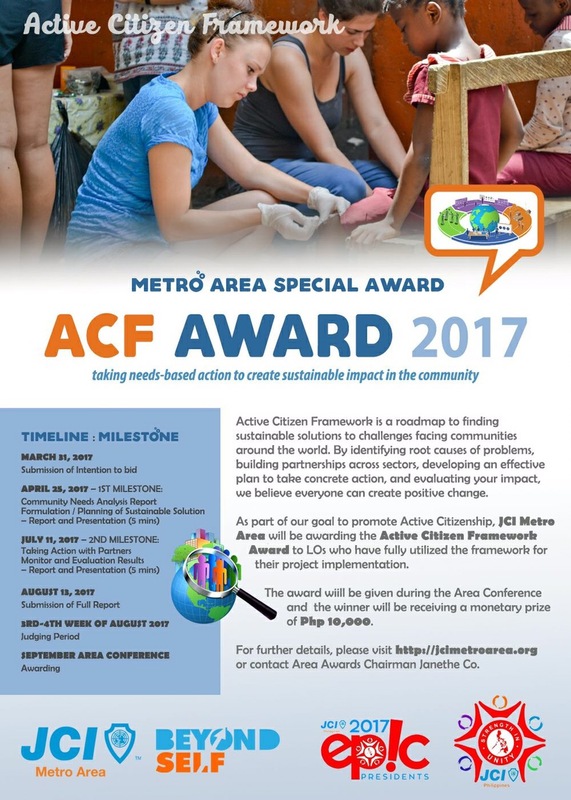 To highlight the importance of this methodology in developing sustainable communities through relevant solutions and impactful projects, Metro Area will be giving a Special Award to LO’s with the Most Outstanding Active Citizen Framework Implementation. This award will be given during the Area Conference this coming September. For mechanics and other details, see the mechanics below. For other inquiries, please contact Area Awards Chairman Janethe Co. Here are the mechanics of the Special Award to be given during the Metro Area Conference this coming September. This was presented to the Area Council by 2017 Area Awards Chairman, Janethe Co last Jan 14, 2017 in the Paraiso ni Baste, Valenzuela City. feel free to contact our Area Awards Chairman Janethe Co.